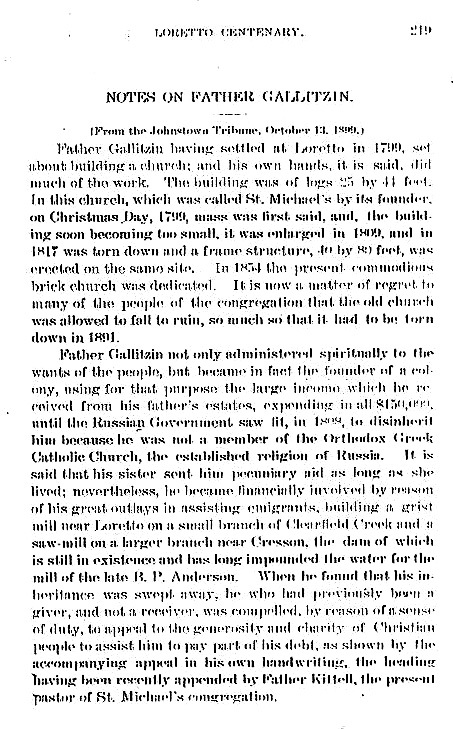 Father Gallitzin having settled at Loretto in 1799, set about building a church; and his own hands, it is said, did much of the work. The building was of logs 25 by 44 feet. In this church, which was called St. Michael's by its founder, on Christmas Day, 1799, mass was first said, and, the building soon becoming too small, it was enlarged in 1809, and in 1817 was torn down and a frame structure, 40 by 80 feet, was erected on the same site. In 1854 the present commodious brick church was dedicated. It is now a matter of regret to many of the people of the congregation that the old church was allowed to fall to ruin, so much so that it had to be torn down in 1891. Father Gallitzin not only administered spiritually to the wants of the people, but became in fact the founder of a colony, usuing for that purpose the large income which he received from his father's estates, expending in all $150,000, until the Russian Government saw fit, in 1808, to disinherit him because he was not a member of the Orthodox Greek Catholic Church, the established religion of Russia. It is said that his sister sent him pecuniary aid as long as she lived; nevertheless, he became financially involved by reason of his great outlays in assisting emigrants, building a grist mill near Loretto on a small branch of Clearfield Creek and a saw-mill on a larger branch near Cresson, the dam of which is still in existance and has long impounded the water for the mill of the late B. P. Anderson. When he found that his inheritance was swept away, he who had previously been a giver, and not a receiver, was compelled, by reason of a sense of duty, to appeal to the generosity and charity of Christian people to assist him to pay part of his debt, as shown by the accompanying appeal in his own handwriting, the heading having been recently appended by Fahter Kittell, the present pastor of St. Michael's congregation.